Lot of 59 NEW Speaker Jack Wall Plate White 16 GA wire Dual Clip up to 16 AWGFree shipping Ter.. 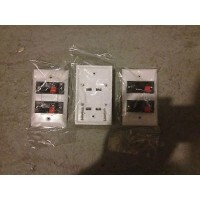 Description :Title : 25 NEW Speaker Jack Wall Plate White BANANA ClipModel : BANANA Brand : Unbrande.. Description :Overview : This adjustable tilt universal wall mount adjusts to fit most 30" to 65" ..